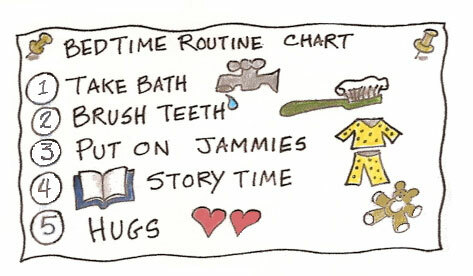 I absolutely love routines but that’s probably because I was a primary school teacher!!! On holiday I am fine with less structure but at home I literally can’t function as a working mother of 4 without clear routines. I really believe they are incredibly important for children of all ages. What are the benefits of routines? Provide clarity so children know exactly where they stand and what is expected. Routines (when applied consistently) eventually become habits and result in less nagging, repeating, justifying and reminding from parents which has to be good for your relationship with your child. There will simply be less to argue about. Kids will feel more independent and ‘in charge’ if they don’t need to be reminded. When followed through, routines allow more time to do other things as opposed to being oppressive. Children and teens feel more safe and secure with clear routines. There is less stress, chaos and anxiety so kids are more likely to co-operate. Write the routine down and stick it somewhere as a reminder which helps to depersonalise it. If the child is old enough they should write it out. For younger children use pictures or photos of them doing the right thing. Follow through consistently and in a few months the routine will become a habit.